Outfielder Tristan Murrell has a problem. As the number two slugger for the Suttonville Sentinels, his team is counting on him to make their very first run at the state championship. But he has a secret—his swing has totally deserted him. As in, he can’t hit anything. He needs to fix the issue, and fast, but how? Ballerina Alyssa Kaplan has a problem, too. The shiny new sports complex in town has left her family’s batting cage business on the verge of going under. Nailing her audition for a prestigious dance company is everything, but there’s no way she’s letting her some shiny big-box company destroy her family’s livelihood. Disclaimer: This book contains hot, shirtless baseball players, kisses that bring a ballerina to her knees, and a lot of baseball smack-talk. 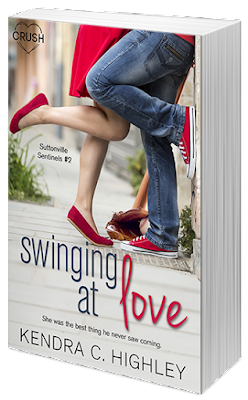 Swinging at Love is really cute baseball love story. I really liked the best friends like same person element. I can’t remember if I’ve seen that in a story before, but it is something that used to happen when I was in high school. I also like the struggle of the family business (my parents had their own business) and the loss of Kyle’s swing. Alyssa is a tough cookie. She’s an ex-softball player and current ballerina. Even though she gave up softball for dance she still has a soft spot for the game. She works at her family’s batting practice facility. A task she loves to both help people with their game and up keeping the equipment. 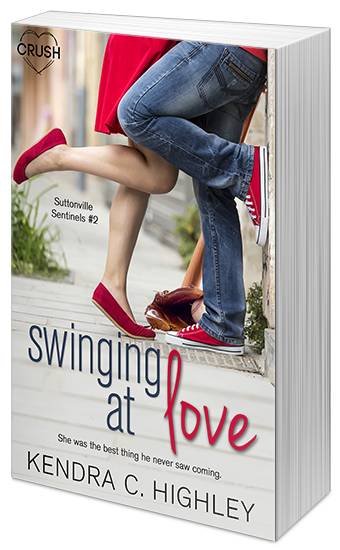 When a large franchise comes in and threatens to put Swing Away out of business it throws Alyssa through an emotional loop, which leaks into her dancing. Tristan is a ball player who has lost his groove heading into playoffs. He tries to get some peace and quiet to work on his swing at Swing Away where he meets Alyssa. I thought the romance was really cute. Alyssa and Tristan bond over baseball. She doesn’t just help him with his swing by being a muse, she also knows the sport and his able to give him tips. It gives them something in common besides just finding each other attractive. I also like the best friends having crushes on the same people. I thought it was a little different twist. Although I would have rather them being honest, they thought they were doing the right thing not to distract anyone with so many important things on the line. Plus even though Alyssa is a strong girl, she sometimes lacks in the confidence department. Especially with her best friend. The only part that really frustrated me was when Alyssa believes the bad about Tristan immediately instead of hearing his side. Besides that they were really cute. I thought the ending was sweet and cute. There is a lot of baseball woven into the story with the playoffs and then of course Swing Away going out of business. So it was definitely the right ending for the book. This is a fun and cute read. It’s one of those that it’s not to take a break with, plus if you like baseball then this is perfect. Kendra C. Highley lives in north Texas with her husband and two children. She also serves as staff to four self-important and high-powered cats. This, according to the cats, is her most important job. She believes in everyday magic, extraordinary love stories, and the restorative powers of dark chocolate.